For some odd reason I’m one of those people who doesn’t like to eat a lot of fruit. Every now and then I really love it and it usually happens when I’m chopping or peeling something like a mango, a pineapple or watermelon. For example, if you offer me some pineapple or mango to eat, I’ll probably just pass and look away. However, if I’m chopping a big pineapple or a nice mango to make my green smoothie in the mornings, I’ll have a handful of fruit and really enjoy it. Isn’t that weird? 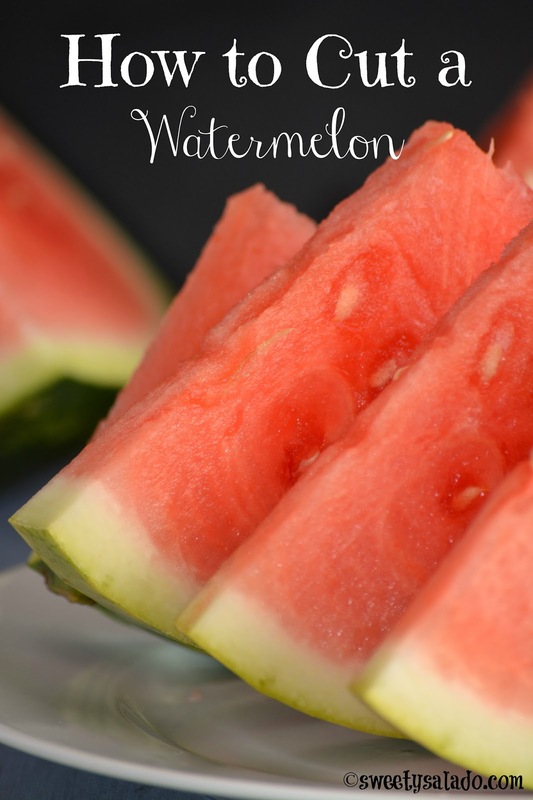 Watermelon is one of those tropical fruits that I like to eat on occasion. I mostly use it to make fruit salads or a delicious Colombian salpicón (fruit cocktail). I just really love how it blends with the rest of the fruit and the condensed milk. I know that nowadays you can find chopped fruit available at the grocery store but it’s so expensive! And only because they peeled and chopped it. That’s why it’s always good to know how to chop any kind of fruit, so you can enjoy it any time of day and for a lot less. Some other day I’ll show you how to peel and cut a mango. I know you may think it’s pretty simple but believe it or not, I’ve seen some people try to cut it like an avocado and we all know that’s a complete fail. 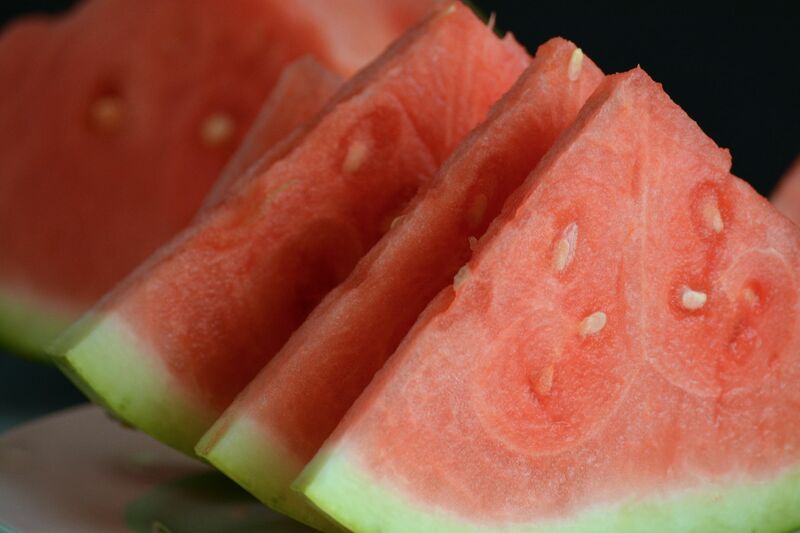 Rinse the watermelon really well under cold running water and then pat it dry with a paper towel. 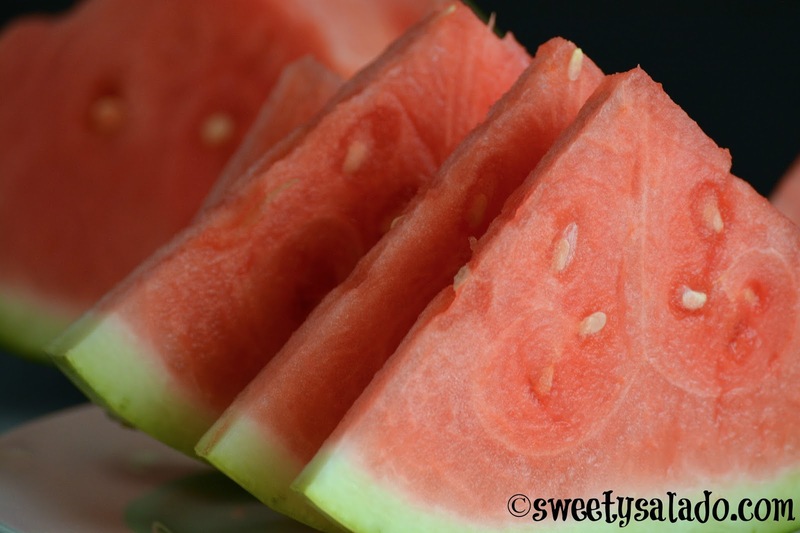 Cut it in half with a sharp knife and place the flat side on the counter. Starting from the top, take off the rind with the knife guiding yourself with the white part of the rind. Finally, cut off the top part and remove any white areas you may have missed. Cut both halves in half to end up with a total of 4 pieces. Then, cut each piece into slices as thick as you want and make vertical and horizontal cuts to each slice to end up with small chunks. Cut it in half with a sharp knife and then cut both halves two more times to end up with a total of 8 pieces. Now you can cut each piece into slices as thick as you want to end up with small triangles.